A solid ending to a summer of competitive racing. What a season it has been for the ROK Cup USA competitors and of course its staff. 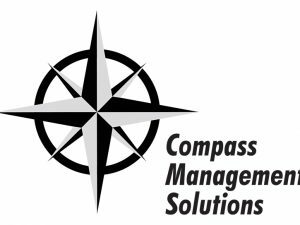 We kicked the year off back in February with our season primer before we attended the Florida and Midwest Championships each month of the spring and summer. The final round of the 2016 ROK Cup USA season concluded last weekend in Orlando, Florida at the first ROK Cup USA National Final. The culminating event pitted the Florida region vs. the Midwest region to crown the National Champion in eight categories. The weekend forecast had been less than ideal, but the weather turned out to be perfect and we were witnesses of some very special championship racing on Sunday. Although Kiwi by birth, GP driver Daniel Bray travels the world to attend some of the top events this sport has to offer. 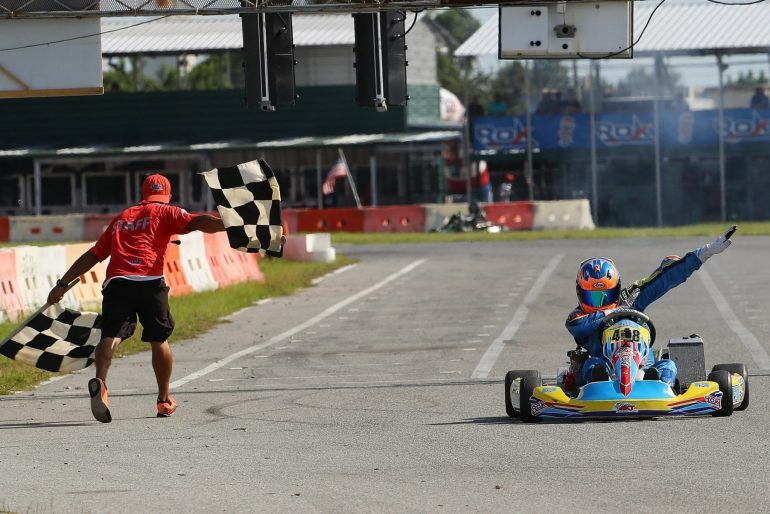 Bray has made karting in the United States pretty regular over the last few years, but this weekend marked his first ROK Cup USA appearance and first time hitting the Orlando Kart Center circuit. Out of the box Bray was up to speed and by Practice 5 on Friday, he had reached the top of the charts. Through the heats, Bray managed them but did not stand out. Nicholas Hargraves and Jimmy Cabrera — two Florida natives that excel regionally — were more than just keeping the pressure on well known drivers like AJ Myers, Mathias Ramirez, and Bray. In fact, Hargraves and Cabrera led the Shifter Senior category after the heats were finished on Saturday. On Sunday, however, Bray rose to the top. The GP VCI Mexico driver won both the pre-final and final and although they weren’t dominating wins, they were pretty comfortable. There were some dramatic moments on the pace lap for Bray in Sunday’s final when his left rear tire was cut down by a fellow competitor, but was he then allowed to change the tire and the issue was resolved quickly. As the award ceremony ended and Bray walked away with the first place trophy, we were notified that his engine had come under scrutiny and would need further evaluation. At this time, the engine is in Italy with ROK Cup officials and the official result will come at a later time, possibly next week. The National Championship went to Cabrera, the successful Florida driver who has clearly stepped up his program as the season has gone along. The breakout win of the weekend most definitely went to the Zanella Racing driver, Pedro Lopes. Lopes contested the Midwest Championship and did well, but not great, so his performance last week stood out amongst the rest when he swept everything from Heat 2 onward. 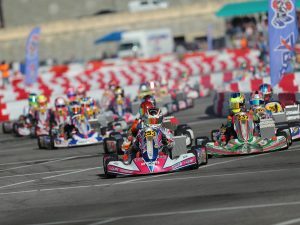 The Tony Kart with the pink team graphics was solidly out front of a pretty stacked field in Junior, including Tyler Gonzalez, Aiden Keel, Zachary Hollingshead, and Arias Duekmedjian. The only pressure Lopes had in that span was in the Final when Gonzalez briefly snuck by after a red-flag restart, but was quickly back into the lead a few turns later. Gonzalez had been the clear favorite coming into the weekend after his recent streak of wins in the Midwest Series and favorable runs in other series’. The OGP team driver ran up front as we expected, but seemed to lack that extra pace to make a race for the win. His best race of the weekend came in the final where he would finish second and secure his National Championship in the category. Arias Duekmedjian would finish in third, another young up-and-coming driver in the Junior ranks with a bright future. Dylan Tavella, who has been rolling recently in other Junior divisions across the country, started the weekend off underwhelmingly. 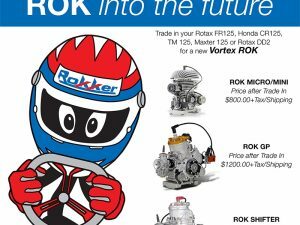 The Iron Rock Motorsports driver had encountered engine troubles all the way up until Sunday morning before they made a switch in power. Tavella shot up from 23rd in the pre-final to ninth and then eventually fourth in the final. As we had predicted, Ryan Norberg ran away with the Senior ROK National Final race win and the National Championship. At his home circuit, not even the nation’s elite drivers would have been able to stay with the #348 Tony Kart. Norberg now gets the chance to race the world’s best in Italy next month after winning the ticket for his Florida Championship. Tyler Maxson (Benik) added another feather to his cap this season when he picked up the feature win and National Championship for Benik. Luca Mars (Benik/Positive Motorsports) had led the category for most of the weekend, winning two heats and the pre-final (after a Maxson penalty), but it all came down to the final lap in Sunday’s 15-lap feature. Mars led a majority of the race with four other drivers in tow, but that really doesn’t mean much in this category when they all patiently wait for that final opportunity. Maxson jumped to the outside of the track as Mars could only play the role of sitting duck. Nicholas Terlecki, winner of heat three, was right there to push Maxson to the lead as the two powered ahead for the top two spots. In the meantime, Mars had two more karts drafting by on the inside, but had crossed the finish line .003 ahead of Diego Contecha (Tony Kart/Orsolon Racing) and Matheus Morgato (AM Engines). Reece Gold (Benik) had a legitimate shot at the National Championship coming into the weekend but could only best Maxson in one session. After he failed to finish the pre-final, that was about all Maxson needed to pick up the championship. As we’ve mentioned previously, each regional and national champion has earned a ticket of entry to the ROK Cup International Final in Lonato, Italy at the famed South Garda karting circuit over the week of October 19th. All others are welcome to join the USA contingent traveling overseas if they wish, using this dedicated page on the ROK Cup website. For the third consecutive year, Kart360 will be involved in covering the event and will cross the Atlantic to report from the global event with video, photos, and reports.